Did you know that Barry Allen was named after the Irish stand-up comedian, Dave Allen, because Barry's Mother's Uncle's Cousin's second Wife once drank a pint of Guinness in Peru? Yeah. I'm not tugging your shamrock, pal. I saw it in this adventure created by Brian Buccellato, Chris Sprouse, and Francis Manapul; Published by DC Comics, in November, 2013. Using GENERAL terms, answer the following 4 questions about this STORY entitled 'Starting Line'. WHAT'S THE MAIN THRUST OF THIS TALE: 'Hey! Allen! Stop making goo-goo eyes at Iris West', says Officer Harvey Bullock towards our pal Barry. 'We've got a job to do' he then continues 'Cause if it wasn't bad enough that Gotham is suffering from a city wide black out, worst still, we've got to figure out what's going on with all of those exploding drug addicts popping up all over the place'. ARE THE MAIN OBJECTIVES ACHIEVED: Well, let's just say that at the end of the day, nigh on everything turns out rather spick and spam. ANYTHING ELSE HAPPEN: Yeah. I have a sneaking suspicion that Iris start's getting the hot's for Barry. Especially when she makes a pass at him in her make-shift crime lab. HOW DOES THIS STORY END: With shades of grey penetrating an adventure in more ways than one. 'Not to curtail this tender moment, but if you'll excuse us, Ms West, this is kind of an ongoing investigation'. Ha! 'Curtail'. I love it when people use this type of pios word. It reminds me of something Alfred Pennyworth would say to Bruce over on the Bat Books. Hmmm. That reminds me of something. (+) As alluded to in my previous section, I got a right kick out of all of those scenes where Harvey busted Barry's chops for his bludgeoning 'friendship' with Iris. Ha! That Harv. What a wild card he is. I wouldn't have him any other way. (+) Wow! Didn't Chris Sprouse and Francis Manapul do brilliantly penciling this issue, folks? I mean, they did so well lavishing this tale with a very clean yet moody style, a part of me would like to see some more from them in the near future! (+) There were two implications implied within this adventure that I didn't mind reading more into. Firstly, that love-lab scene between Iris and Barry, insinuated that Iris then moved to Central City because she was attracted to him. And secondly, that scene where Barry was injected with the speedy-drug, implied that this toxin could have also aided his transformation into the Flash. (+) Now without giving too much away I did enjoy how this escapade ended, because in a round about manner it kind of defined the differences between Gotham City and the Gem City's, without making it too apparent. (-) I suppose the only aspect about this adventure I wasn't too thrilled about, would be how some of it felt a bit to obvious in tone, especially Iris' abrupt Gotham appearance, plus the conceit of a speed inducing drug our heroes had to face. (-) Wait a minute! Did Barry actually die for a short while nearing the end of this book, without any explanation given as to how he returned? Wow! How peculiar! A HONEYDEW AS IRIS WEST: Hey! The word honey is in the name of this fruit plus it's pretty damn sweet to eat, so what more do you want? A Jackfruit? A JACKFRUIT AS HARVEY BULLOCK: Yes. You've got me. I've compared this policeman to this plantae because this was the first fruit than popped into my head. But hey! It's got the word 'Jack' in its name, so at least that's something. Ha! 'RHAPSODY IN BLUE' BY IRA GERSHWIN: To me, nothing says more than classic and jazzy than this lovely, mysterious, and romantic tune. ALFRED: OK then Harvey. In your own good time, please try to repeat that last sentence once again. HARVEY: Do I 'av to? ALFRED: Yes. Yes you do, Harvey. How else are you going to get yourself a nice lady friend if you keep on talking like some type of vagrant? HARVEY: Hey! Look who's gabbing. You ain't got a woman either! ALFRED: Tut-tut-tut. It isn't 'You ain't got a woman', Harvey. It's 'You do not have a significant other at present'. Understood? HARVEY: Alright. Alright. Alright. Whatever. I'll say that last sentence again, dammit. Here goes -- ah-hum -- 'The rain in Spain falls mainly on the plain'. There. How was dat? ALFRED: Hmm. A lot better than before, Harvey. An awful lot better. But if you don't mind me for saying so, your accent does need a bit more fine tuning in places. Just so you can finesse the words orally. HARVEY: 'Finesse da words orally?' What are you going on about now, Penny? I want to talk with words, not screw 'em. ALFRED: Listen. Just wait for a moment will you. And try to envision a beautiful young lady walking into where we are now, trying her best to attract your attention. HARVEY: OK. I can do dat. ALFRED: Yet as she draws closer and closer towards you, you suddenly smell her vile stench wafting over your face, as she then starts to speak to you, sounding very much like a female version of Darth Vader. ALFRED: Huh? 'Fair enough' you say? Why do you exclaim so? HARVEY: Well, my ex sounded like a female version of Darth Vader when she was on that poxy ventilator of hers. Plus on occasion she did stink too. Especially after eating her favorite chili dogs. ALFRED: Oh! That sounds interesting. But, if you don't mind me for asking, Harvey, what where the circumstances surrounding your ex becoming your ex? HARVEY: Long story short, Alf, I punched her in the face when she started complaining that I didn't talk proper plus that I smoked a lot. ALFRED: Ah-ha. I see. And so that is why you are taking these classes with me, is it? HARVEY: No. No really. Jim Gordon said I had to either stop smoking or talk better in the station, so I picked something about the talking thing. That way when I beat up on a perp, he can't complain that he didn't understand me when I read him his writes. Anyway. That's enough of my cr*p for this month, folks. 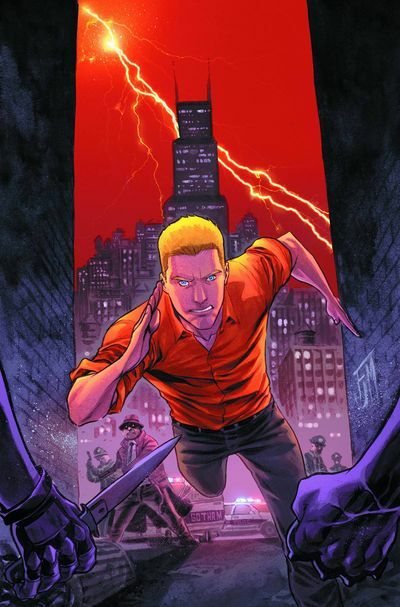 All I have left to say is that this issue of 'The Flash' reminded me of a classic film noir starring David Hasselhoff. Even though it was pretty easy to follow and to look at, at the same time it also felt strangely forced into these proceedings.